Is your dog prepared for cold weather conditions? Depending on where you live, winter can mean freezing cold, mild humid conditions or anything in between. A harsh winter wind with a freezing wind chill can be just as dangerous as a cold, drenching rain. 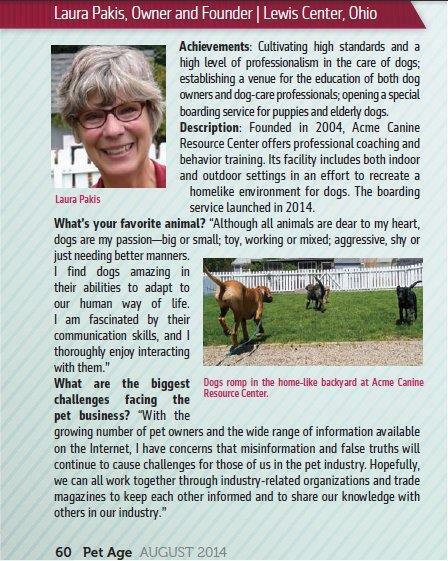 In addition, dogs not accustom to frigid winter weather or warm sunny climates may be uncomfortable until they adapt. There are no hard and fast rules which constitute when weather may be dangerous to your dog. So its important to know your own dog’s ability to tolerate weather changes rather than take chances. If you’re not comfortable and have to bundle up, your dog could be at risk. Pads may bleed from encrusted snow or ice. 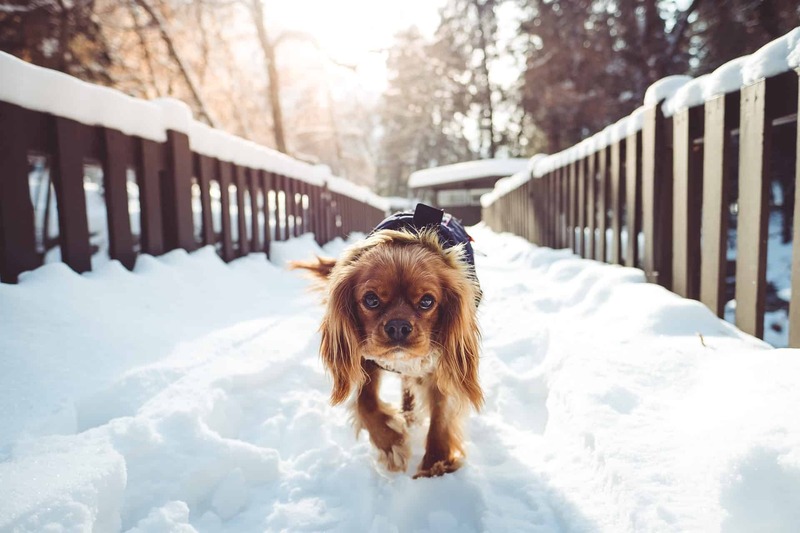 There are several products on the market designed to protect dog paw pads during the winter from “pet safe” de-icing products to protective waxes and dog booties. In addition, dry winter air can contribute to drying and cracking pads. Consider using a humidifier in your house in addition to applying a product like Musher’s Secret to your dog’s pads. Keep your dog’s nails trimmed and cut the long hair growing from between the pads of each foot to help them have the best traction on ice and snow. On dogs with long feathering on the back of their front legs, trim any excessive long hair so it doesn’t drag along the ground and gather snow bunnies in the fur. Extreme cold is just as dangerous for dogs in cars as extreme heat. The car can act as a refrigerator in the winter. Snow may cause stomach upset. In addition, dogs can ingest salt, antifreeze or other chemicals while licking their paws. Consider using coolant and antifreeze products that contain propylene glycol rather than ethylene glycol. 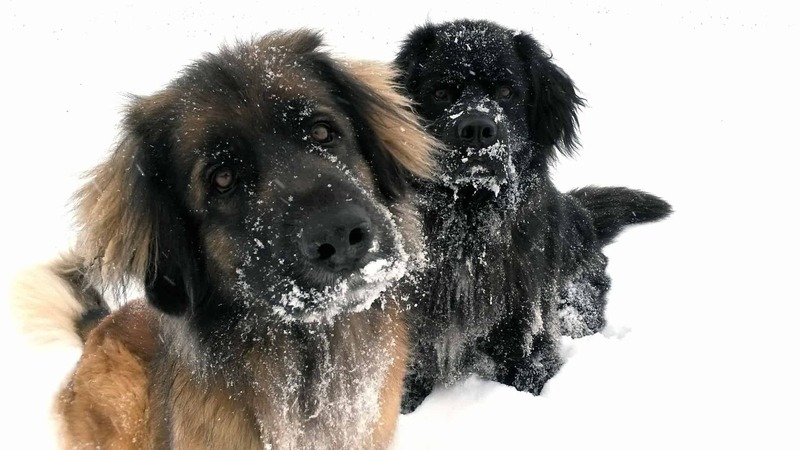 More companion canines are lost during the winter than during any other season. 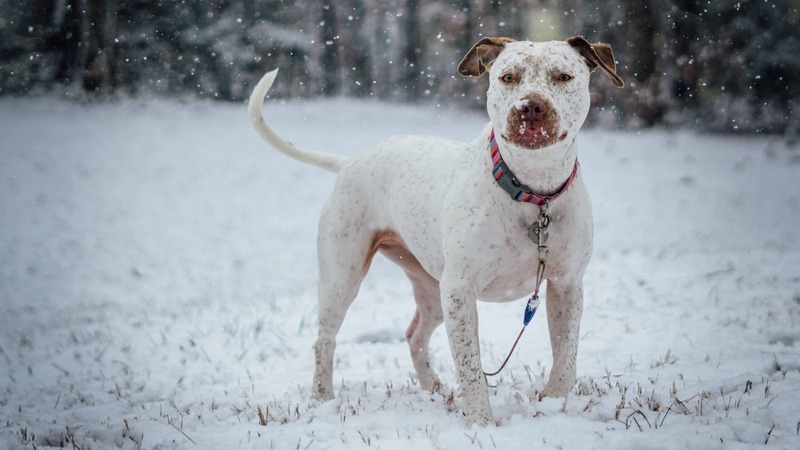 Snow and ice on the ground can cause a dog to lose their scent and become lost. For this reason dog owners should have up to date microchip information on their dogs as well as identification tags. 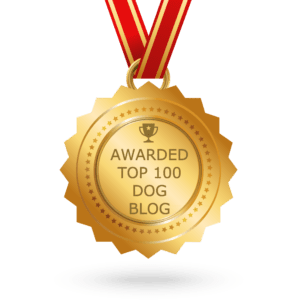 This may sound like a strange practice but a veterinary visit might be in order if a dog hasn’t had a yearly checkup or if he’s not doing as well in the cold as he has in the past. Heart disease, kidney disease, and diabetes can interfere with a dog’s ability to maintain his body temperature. As a general rule puppies, elderly dogs, dogs with health conditions, short haired or short legged dogs are particularly sensitive to cold temperatures. Being outside too long can lead to an increased risk from hypothermia and even frostbite for them. 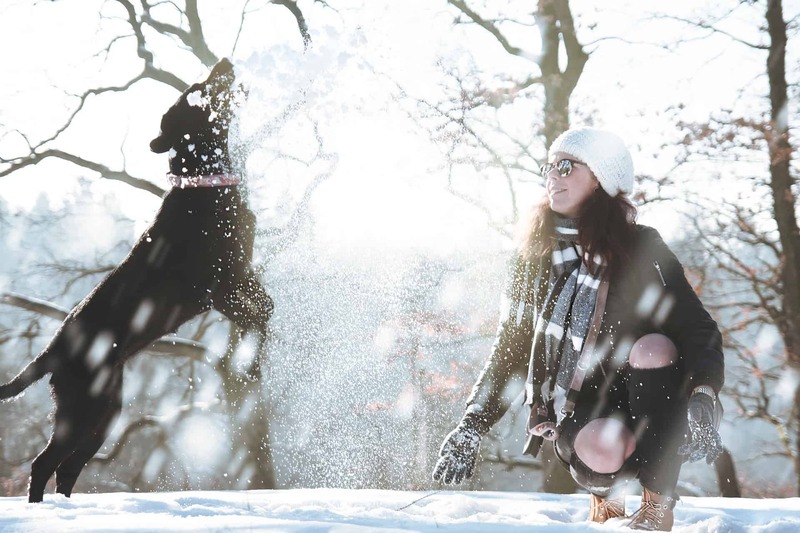 This may seem like a “no brainer” but basic obedience training allows dog owners to enjoy winter weather conditions safely. Loose leash walking will make slippery walks safer for both you and your dog. 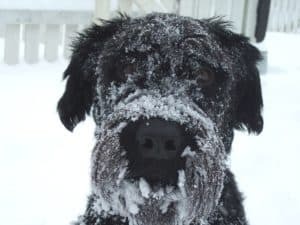 The “Leave it” command can save a dog’s life when confronted with a pool of antifreeze or an unknown object in the snow. The “Recall” command (coming when called) can keep a dog from running onto a partially frozen body of water or away from another winter hazard. Even the “Stand” command can help with wiping down a dog’s feet. Use this command while wiping off your dog’s legs and stomach when he comes in out of the rain, sleet or ice. 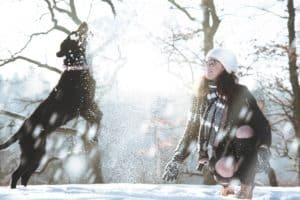 Playing in the snow can be a great activity for you and your dog. Being aware and taking the above precautions will keep your dog safe while outdoors. So bundle up, both of you, and prepare for a safe winter season.